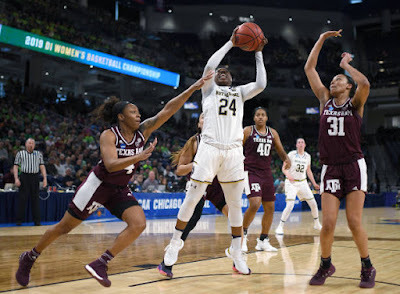 The first of two Chicago regional semifinals delivered as the Notre Dame Fighting Irish escaped against the Texas A&M Aggies 87-80, behind a 12-point fourth quarter from Arike Ogunbowale. Ogunbowale’s career-high 34 points highlights my five takeaways from Wintrust Arena. With a tense atmosphere in the fourth quarter with each possession as a potential momentum swing, Arike Ogunbowale grabbed the moment by the horns with a steal and layup as the crowd came unglued and served as a turning point as the Irish took a 74-69 lead with 6:07 left in regulation. Notre Dame coach Muffet McGraw is used to the superstar making clutch plays on offense, but liked the change of pace by making a stop on defense. “Arike wins it with a defensive stop, I think that should be the headline,” McGraw said. The momentum stayed in the Fighting Irish’s favor as they did not trail for the remainder of the game for their closest outcome since the 72-65 loss at Miami (FL) on Feb. 7, which was their last loss. Despite dazzling the crowd with one high-arching three-point make after another, Chennedy Carter’s game-high 35 points proved to not be the ultimate takeaway as the Aggies came up short. The sophomore embraced her teammates after the buzzer about the effort given for all 40 minutes. Jessica Shepard finished with her 16thdouble-double of the season (24 points and 14 rebounds), but it would be a stretch off 11 straight points in the first quarter to help stabilize the Irish in a game where each play was mattered. “I think we knew our offense would get going at some point, so I think in that quarter they did a great job of getting me the ball and then just finishing strong inside,” Shepard said. Shepard’s stretch proved to also be critical as the Irish missed five of their first six shots of the game and will be needed to continue to produce if they want to repeat as tournament champions. From the opening tip, both teams turned the pace up to the extreme as the lead exchanged on 14 occasions in the first 20 minutes of action. Both teams finished at a high level from the field with the Fighting Irish going 36-of-69 (52 percent), while the Aggies went 32-of-69 (46 percent). Notre Dame’s 52 percent shooting was the most Texas A&M gave up on any opponent this season. Blair believed a pair of field goal makes in the first 50 seconds of the third quarter highlighted the Aggies’ difficulties of stopping the Fighting Irish. “The role, the transition baskets. I think they hit four points in a row and I had to use another time-out, I thought that was the key right there. We just couldn’t stop them from scoring,” Blair said. The NCAA women’s tournament has been known in the past to have only a handful teams with a realistic chance of winning the national championship. Saturday’s contest proved to be the opposite as the outcome hinged on a possession-to-possession basis. Even in defeat, Aggies coach Gary Blair liked the intensity of the contest from the start to finish as opposed to a non-competitive affair. McGraw echoed similar feelings about the increased parity in the women’s game.